Y'all know by now that I'm a helmet cam junkie - whether by watching footage from other bloggers, or from the pros riding at the highest levels of competition. 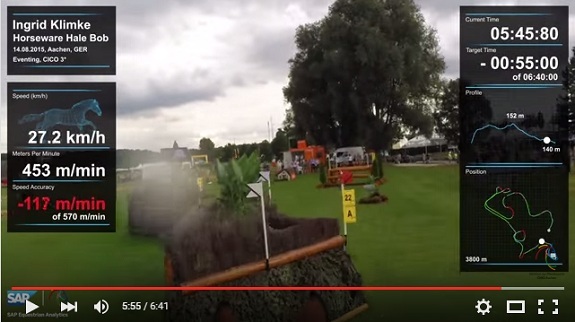 One of those pros - Ingrid Klimke - has been utilizing SAP's Equestrian Analytics in her videos and I noticed something interesting while watching the footage from her recent win at Aachen. somehow this screenshot from the footage makes it look easy, doable. spoiler, it isn't!! 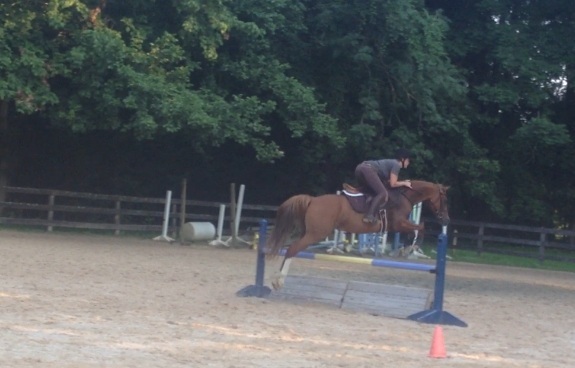 It's all related to my tireless efforts to understand what the right jumping canter should be, and how to get there. This is all well and fine, except I've sorta misunderstood both these ideas. In fact, I still might not get it, but I'm maybe closer. My problem with Dan's directives was that I just started running Isabel at the fence. That's 'forward' right? And with the DOC 'preparation zone' I simply stopped doing anything a few strides from the fence. Recall this is what prompted the warning about confusing softness for effectiveness. So the interesting thing about watching Ingrid's footage was actually watching her speed throughout the course. Specifically, I noticed that she cruised around 700mpm (give or take - I just eyeballed the numbers), and as the jump would come into view she'd fairly dramatically re-balance the horse and drop down to about 480-500mpm (or lower to around 400-450 for more challenging combinations). Then she would accelerate to the fence - getting back up to almost 550-600 by takeoff (again, depending on the type of fence and whether it was a combination). Obviously the actual speeds changed depending on the question (ie combo vs. galloping fence), but she accelerated to almost every single fence. Some were jumped from a very slow pace - but it was still moving forward after her initial adjustment. And some (like the easier galloping fences) were jumped from fairly close to cruising speed. Gallop along at cruising speed. At some distance from the fence - close enough that the horse understands he's to jump that fence, let's say six strides out - re-balance and collect the canter, then move forward up to the fence. Somehow this really helped me make sense of what both DOC and Dan have been trying to say. I checked in with Dan about it (bc obvi I don't exactly have DOC on speed dial) and he more or less concurred that this was what he was trying to get across - tho again he warned that it's difficult to lift the horse's shoulders while accelerating, so I should be careful in thinking about it that way. Really, what he means when he says 'forward' is to get more lift in the horse's shoulders - more 'jump' in the canter and more horse in front of my leg. 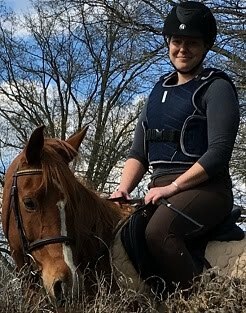 But in watching this footage I at least have a better idea of when and HOW to start preparing for the fence, and how to ride those last few strides. Definitely good food for thought! It's kinda funny how many different channels I'm going through to understand what seems, superficially at least, like a simple concept. Have you ever had any unexpected 'aha' moments watching a random video? I think watching professionals ride is extremely educational! Even though I don't event and never plan to, I really enjoy watching XC because it shows exactly what you're talking about: how the pros balance and adjust the canter and approach each fence, and those same skills can translate over to doing a stadium course. I also enjoy watching the big jumper horse shows for the same reason. Huh. Super interesting! Kudos to you for noticing this trend. I think going forward to the jumps is absolutely a trickier concept than it seems. Maybe the acceleration is a result of that nice canter where the shoulders are lifted? i love helmet cam footage - forever and always amen lol. and thanks for the nomination! I LOVE helmet cams too!! yay glad to hear that! Interesting and I agree! Often in hunters we talk about energy versus speed! Wow, that is very interesting. At the Selena clinic I went to earlier this year, she told us to 'check balance, sit up and push our shopping cart'. I got it and it was inspirational but the way you said it is more of a linear thought to me, not something I need to memorize. Just a process. Thank you for sharing! I really got a feel for this in my last few lessons and XC schools with Murray. If I let him just go balls out he tends to gallop in a very downhill frame -- he likes to drag himself along and, for the most part (I've not been yelled at yet), that's okay for the flat stretches. He seems to look where he's going and take care of not falling into holes. And then as we're approaching a fence I need to get his attention back, so more than 6 strides out (probably 10-12 strides I'd guess) I sit up and ask him to look up, see what we're coming to, and balance back onto his haunches. This usually relates to a slowing in speed, like you said. Around 6 strides out I like to feel Murray locked on to the fence -- when he does this he gets this powerful, bounding, "jumpy" canter (lots of "bounce" as Hawley Bennett would say), and I can make adjustments if I need to. If we need to add I can hold him back -- though more and more he compresses himself. If I don't feel him lock on I can add leg and make sure we're on the same page in terms of jumping. I really JUST got this feel, but you described it pretty well above too. OF Starter Trials - cross country! OF Starter Trials - dressage + stadium! 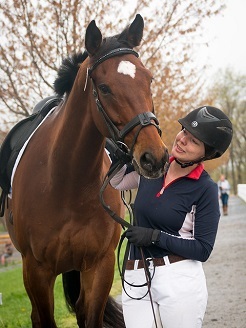 xc schooling + contest winner! blogger meet up with David O'Connor! helmet cam test part 2: jumping in the field! helmet cam test part 1: hi-speed trail ride! it's sunday. have gifs with your brunch!